The hospitality sector is rapidly flourishing because of increasing touristy crowd. Pune experience a steady flow of domestic and international travelers all the year round. TO meet the requirements of touristy crowd, Hotels of all categories are available in Pune. If you are planning a trip to Pune and haven’t decided a hotel to stay during the trip then you can consider Sayaji hotel Pune. 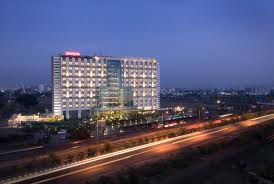 It is a renowned 3 star hotel of Pune which is located on NH-4 at Wakad, Pune in Maharashtra. This hotel is famous for offering unique personalized services, top notch hospitality and urbane luxury. This hotel includes 252 well furnished rooms and all of them are well appointed with modern amenities in order to offer comfortable stay to its guests. The rooms are well decorated and offer a world of sophisticated luxury and comforts. All its rooms have serene ambience, modern furniture and rich interior that will make your stay in Pune luxurious. The amenities offered at Sayaji hotel Pune are banquet hall, cable TV, business centre, telephone, multi cuisine restaurant, 24 hour room service, Jacuzzi, gymnasium, laundry, Tea and coffee maker in every room, conference room, hot and cold running water, wireless internet access and iron.